Presentation Academy challenges young women to develop their greatest potential as leaders in a global society. They stand together on behalf of vulnerable children and their families to lift up the voices of refugees, immigrants, and the faith community in support of refugee and immigrants’ rights. 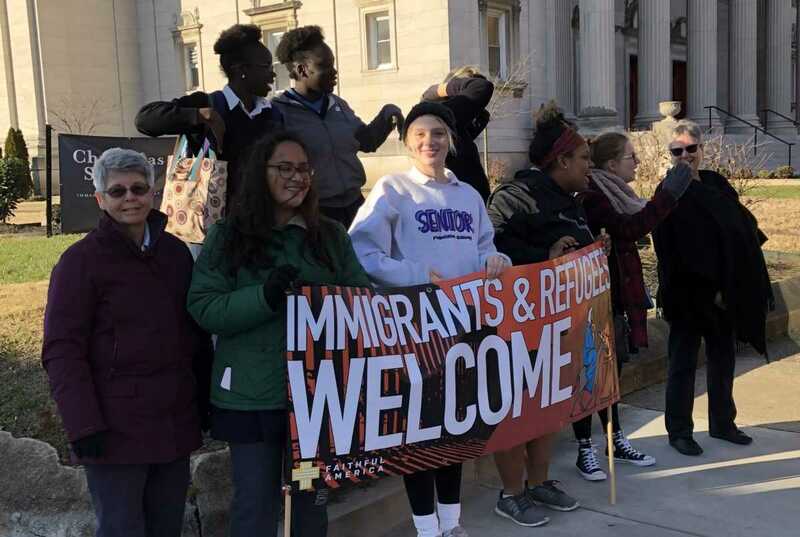 At the corner of 4th Street and Breckinridge Street in Louisville, Kentucky, you will find Sister Amina Bejos along with other faculty and students at Presentation Academy standing in solidarity with immigrants. They gather here every second Tuesday of the month. So wonderful that Sr. Amina and the students stand in solidarity with immigrants and refugees!! I have visited Nazareth many times. With all the acreage at Nazareth, there is room to house at least one hundred migrants. Perhaps a facility could be built where Russell Hall once stood? Fantastic. Keep up the good work. The students at Presentation will remember this activity for years to come. God bless you Amina and all those who are participating. Amina, you make me so proud. Of all the schools in the nation there is none like our P.A. Your presence there is SO-O-O-O important. Thank you for all that you and Pres does for the future of this country. How great- responding to a need that is so close to home…thanks for standing in solidarity! Love! Great, Amina! We at Nazareth are trying also. We are helping the immigrants on th bus with Fr. Jim Flynn. Don’t you wish our president would pay attention? So glad you all at Pres is trying to make your voices heard!! gift of love and compassion! !